Recently picked up a superb condition example for £50. This player was supposed to support my CD transport needs for the rare occasions where I play CDs, and my DVD player (now only playing movies) was quite frankly appalling compared to my PC & HagUSB setup into my DAC. Usually I've enjoyed using old Philips swingarm based machines as transports including Rotel 965BX and Marantz CD65DX (with hall motor), but the stable platter transports picked my fancy as they seem to have a cult following like the swingarms do. I was disappointed as one of my reference CDs, Lamb's "What Sound", quickly showed my computer-based transport a clean pair of heels. The Pioneer PD-S505 instantly added more "weight" & "authority" and allowed my Amphion Argon2s to throw an even bigger soundstage with more delineation between performers & instruments. I guess I wanted the HagUSB combo to sound better as this is what I listen to a lot of music through. Listening to Joni Mitchell's "Blue" on CD the vocals are much more organic and lack a slight hardness in the extreme treble that I've previously had with other transports. This CD will tear apart bright and/or sibilant systems! Looks like I'll be using more CDs for a while! Great post I fancy trying one of these as a transport based on what you have said!! I always fancied a stable platter deck but after my PD-91, which was superb, I never returned to Pioneer. I had one, into a Stan B dac, in all honesty I have heard better. Please don't think I'm pis*ing on your parade! Another thing is that most spare parts are *still* available via Pioneer, which is not bad for a 10yr old player! In stock form they are overated, I tried one in stock form as a transport into my dac when my Teac P500 started to go belly up, the Teac left it for dead. The Pioneer does have potential though and can be turned into a very good player/transport with selected modifications. I can't recall the exact model without a load of searching, but I am sure it was higher up the model range. Now...what didn't I like? It really just did nothing for me, bear in mind though it was un doctored, but I found it rather a bland machine, absolutely nothing about it excited me! You know sometimes you get that " Wow! that is great!" feeling ? Well not in this case! I soon returned to my (as of then) Minimax player, which was great, despite members from "that" othre forum took the pee, saying it looked like an old vhs player, which it didn't incidentally! ...are actually inferior to the PD-S505. It's the suffix number (05) which is more of an indicator. In fact, not even the PD-S605 has a dedicated SPDIF output board. 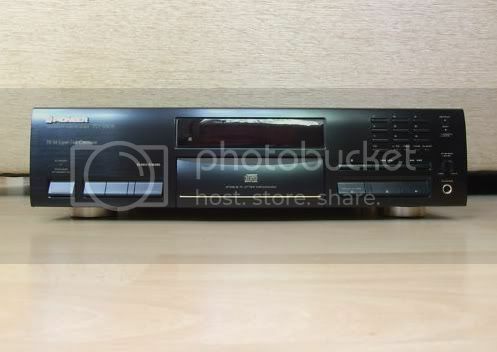 I've got a Pioneer PD-S705 bought in mint condition for £39. I use it as a transport with an old 90s vintage Dacmagic II Mk2. For the money I like it. It is nice that you can switch off the analogue outputs and the display. Also the machine reads every scratched up disc I have thrown at it. It reads discs fast and operates smoothly and quietly. I have lined the insides with sticky sound deadening material. I have not heard any high-end transports but the combination with the old Dacmagic (also bought for around £40) would surely be hard to beat at a combined price of around £80. Finally found the model....it was the 703.